As currently constructed, this version of the Boston Red Sox may be better than we've seen over their current run which has resulted in four trips to the ALCS and two trips to the World Series. Be prepared for it to only get better. Tim Wakefield is as dominant as we've seen. While both of Boston's expected aces Josh Beckett and Jon Lester have turned it on as of late, it was Tim Wakefield holding the Red Sox staff together through the first month and a half of this season during their struggles. In 9 of Wake's 12 starts he's managed his way through at least six innings and through seven innings four times. Some wouldn't dare use the word "consistent" to describe Tim Wakefield and the knuckleball, but in 2009 that is exactly what it's been. After notching his 8th win of the season last night (which gives him the second highest win total in the majors), it's hard to argue that Wake isn't going to continue his success. With Beckett and Lester hitting their stride, Tim Wakefield approaching 10 wins before the All-Star break, can you argue that there is a better staff of starting pitchers in the majors? Maybe that is why the Red Sox boast the best record in the American League and have just dropped the Bronx Bombers for the seventh straight time. Ellsbury is setting the table. One of the major questions surrounding the Sox prior to the start of the season, would Jacoby Ellsbury turn it around after his less than stellar 2008? 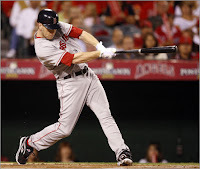 Would Ellsbury be able to get on base for reigning American League MVP Dustin Pedroia and Kevin Youkilis? The answer, yes. You know about Ellsbury stealing home plate on the national stage that is Sunday Night Baseball, but what you might not have realized is that Ellsbury is in the midst of having his best year in his short career. Ellsbury is currently ranked among the American Leagues best in both batting average and hits. Gone is the player who hit just 155 hits in 145 games last season, in his the player whose already approaching 80 hits in just his first 50 games this season. The leadoff hitter in the Sox lineup is more important than ever, with hitters like Youkilis and Pedroia batting behind him, that leadoff guy is bound to get driven in and give the Sox the best chance to win. Ellsbury seems to have brought his hitting up to par with his base running, anyone who knows these Red Sox know that if Ellsbury can not only get on base but also get in scoring position, it's scary how successful the top of their lineup can get. Pssssssttttt, Jacoby has 23 steals, good for second most in the majors. The pen is scary deep, and they'll only get better. Yes, Jonathan Papelbon hasn't looked as dominant as we remember, 128 saves over four seasons will do that to a closer. Fortunately for the Sox, the rest of the pen that Theo Epstein has constructed couldn't be pitching better. Hideki Okajima, Manny Delcarmen, Takashi Saito, and Ramon Ramirez are pulling together the best pen in the majors, bar none. Okajima has fanned 29 batters in just 26 innings, including three k's last night when the Yankees had the go ahead at the dish. Manny Delcarmen has allowed just three earned runs in 25 innings pitched, that'd be an earned run average of 1.07, filthy. In Saito's last ten outings he's allowed just one run scored off of him, shutting down hitters to the tune of 19 k's. Despite the two bombs Ramon Ramirez gave up last night, he's been the horse of the stable in 2009. Pitching more innings than any of the horses in the Sox pen, Ramirez has an earned run average south of 2.00 and a WHIP south of 1.00, it's scary that this is the guy they got in exchange for Coco Crisp. With flame throwing minor leaguer Daniel Bard joining the bullpen full time at some point this season, (11 major league innings, 10 k's) the Sox bullpen is bound to get only better. Kevin Youkilis is the best hitter in the American League, prove me wrong. It continues to amaze me at how under talked about Kevin Youkilis is. Mark Teixeira leads the American League in All-Star voting among first baseman, teammate Dustin Pedroia won the 2008 American League MVP, and Jason Bay is the most talked about Red Sox hitter in 2009. I'm going to say it for once, KEVIN YOUKILIS, is the best hitter in the American League, he's a better defensive first baseman than Mark Teixeira, and he probably got robbed of the 2008 American League MVP, DONE. Youkilis is second in the AL in batting average (.350), the Sox first baseman has the best on-base percentage in the entire major leagues (.472), and he's second in the AL in slugging percentage, all numbers that matter, Youk is there. Maybe Teixeira has zero errors this season and Youk has only one, but give him an entire season in the American League East, then we'll talk. Youkilis 2-run homer last night gave the Sox the cushion they needed to drop the Yanks, never mentioned in game recaps. Kevin Youkilis is one of the most underrated players in this league and we can keep it that way, just don't be shocked when he wins a batting title. The 2009 Boston Red Sox may not have the best record in the majors, however as they've treated the New York Yankees this season . . . It's hard to argue they aren't embarrassing the pinstripes. Believe That.